You asked for it, and we created it. 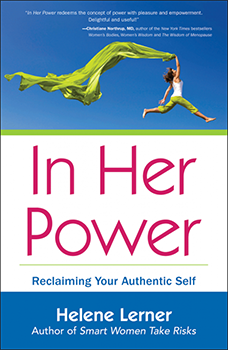 This seven-part webinar, based on Helene’s popular book “In Her Power: Reclaiming Your Authentic Self,” offers ground-breaking techniques that have helped thousands of women step into their power. The course is led by Helene Lerner, public television host and Emmy-Award winning producer, who has been actively empowering contemporary women for more than a decade. Helene is a respected keynote speaker and the founder ofWomenWorking.com, one of the premier websites for career women worldwide. The course includes daily support through “Power Nuggets” delivered directly to your inbox. Find out what so many women already know–Helene understands your aspirations and she is ready to help you achieve them! I am excited that you will be joining me to take our In Her Power webinar. Below are the seven modules that we will explore, designed to create transformation in your life.